Our brakes failed on our way to SGP setting the tone for a non-stop weekend of shamanism. With our lovely yurt as a base, we invited one and all to come and talk about past, present and future shamans. We conversed with around 1000 people, inviting them to channel their inner shaman via drumming and disguise, to learn of the long history of British Shamanism from the Palaeolithic onwards, to create early art and to understand the science of shamanic investigations. Highlights included Henrys’ Shamanic Trees and Camp, ritual grouse burial and his biscuit based fortune telling. Dylan’s drumming and vocalisation was extremely popular and attracted a large and enthusiastic crowd all of whom were energised by the process. We had conversations on everything from Bosnian pyramids, to alien abductions, to the use of mirrors in exorcism and the need for humankind to re-construct its relationship with the natural world (by attending festivals!). We had a rapping shaman, knapping punters and we painted people hands and faces for art and science. Via our iTribes project we now know that the SGP audience is generally from the SE of Britain, although we did find a few wondering souls from Shetland, Ireland and further afield. Thanks to everyone who stopped to chat and get involved. We left with many ideas about the how red deer antler head dresses could be used and worn (as well as a minor injury or two from prancing about wearing them). 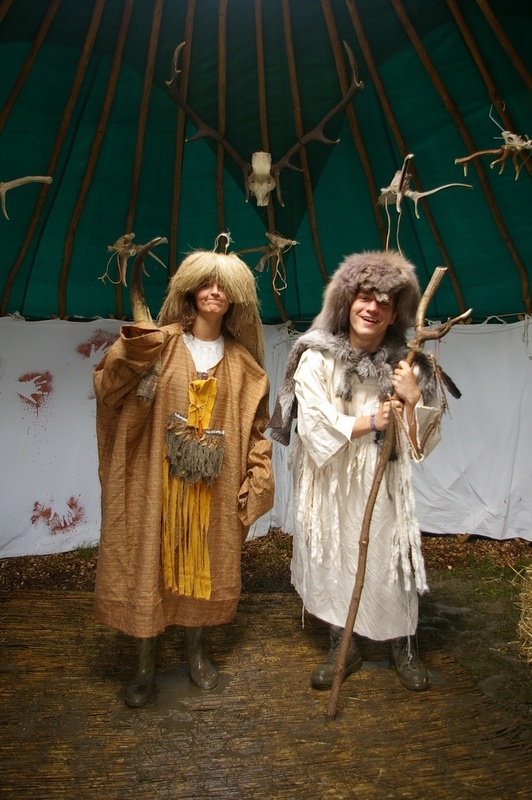 We hope you now know a little more about our common ‘shamanic’ past, the SGP present and left with some ideas for other ways to live in the world in the future. IMGP2809, a photo by GuerillaArchaeology on Flickr. « Find us by the Black Cat….